US$ 950 / person ? 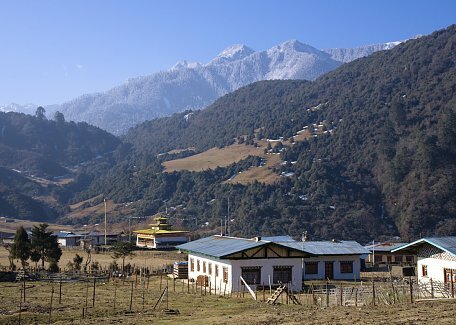 2 Tashigang – Merak Today you will change the car for hardy Bolero jeep and start early in the morning ascending to high mountains of Merak – Sakteng, so called Migoi national park. Migoi is local name for elusive yeti and most local inhabitants will be able to remember numerous cases when they or they relatives encountered yeti in the wild. After two hours drive we will reach Mon-la pass where the welcome party of Borkpa nomads in local dress will be waiting. Experience of local hospitality and yummy nomad lunch, the tasty local spirit and milk-like chang beer. Continue drive to Merak village (3500 m) and accommodation in local farmhouse as a guest of Brokpa family. Explore village and witness the performance of Yak dance and then and Aum Yomo (local deity) dance. Sleeping in simple conditions (own sleeping bag is recommended but not necessary). 3 Merak – Sakteng Start 7-8 hours hike over the 4000 meters high Nyuksang-la pass to the large Sakteng village. The trail offers great view back to Merak and lot of opportunity to see various wild animals like blood phesants and similar. After crossing pass there is long descent to river bed and another brief ascent after which the large village of Sakteng becomes visible. This village was not yet reached by motorable road and maintains quite a nice local culture. 4 Sakteng One day exploration around Sakteng, visiting temples above the village and other notable sites around. 5 Sakteng – Tashigang Morning hike around the Sakteng village and then continue hiking to Tharthi. Good bye party at the small pass behind the village and then continue hiking gently downwards to the Tharthi village. Here we will again take Bolero jeep and will go till the paved road and further to the hotel. 6 Tashigang – Samdrup Jongkhar, onward to Guwahati This will be all day drive descend from the Himalayas southwards to Indian border. You will start early in the morning, going the same way you came here on the day one, going around Yongphula airport, Sherubtse university. Don't forget to stop for another blessing at Damthang before reaching Smadrup Jongkhar. After immigration formalities, you will tell good bye to your Bhutanese guide and driver and Indian counterpart will drive you to Guwahati. This is the tour end. Extend stay in Merak (+1 days): Staying one day in Merak might also be good idea. You can explore the surroundings or try to negotiate holy Aumo Yomo peak (somewhat over 5 thousand meters) or explore village more thoroughly.